An elderly woman died in a house fire early Friday morning, March 15, despite her son risking his own life to save her. 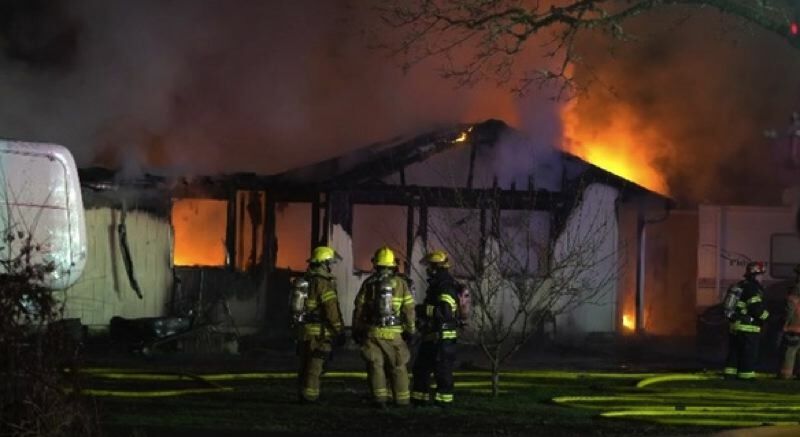 Before multiple agencies responded to the rural fire in rural Boring — north of Sandy — neighbors rushed to help as the family's home went up in flames. "I ran over and did what I could for Bob," neighbor Roscoe told KOIN 6 News, a Pamplin Media Group news partner. "I hope the guy makes it." Neighbors said the homeowner cares for his mother, who is wheelchair-bound. While he went inside the burning home to rescue his mother, the man's own son was trying to use a chainsaw to cut through the wall of her room. However, he couldn't see his grandmother. The son later found his dad collapsed at the front door and pulled him to safety. "Very brave people," neighbor Melissa said. "(The) father was brave to try and go in and save his mom and the son was very brave to save his father." The elderly woman, who is said to be in her 90s, died in the fire, and her son was rushed to the hospital with critical injuries. Neighbors described the woman as the "sweetest lady" and said she would make Christmas cookies for the neighborhood. "They're wonderful people, very giving, kind people," Melissa said. "They'd help just anybody." Firefighters said it took roughly 10 minutes for the first crew to arrive. "Once the fire is involved like that, every minute it really doubles in size," Sandy Fire Chief Phil Schneider said. According to neighbors, this fatal fire is just the latest tragedy for the family. "The homeowner's wife passed away and her ashes were in the house," Melissa said. "That's a hard loss. The whole thing is a hard loss."